Indotechboy — ECM or Error Code Modeler is a compressed file format usually used to store disc image files like .bin or .iso. If you like to download game ISO's from some website (oops ), you may once noticed that you got a .ecm file instead a .iso or .bin after you extracted it. Don't worry, you are not downloading wrong file. ECM is a special technique to compress CD image in order to get smaller size of the CD file. The point of compressing into a .ecm is to get smaller size of CD images, so we can save bandwith when downloading or uploading and save more space used for the disc storage. 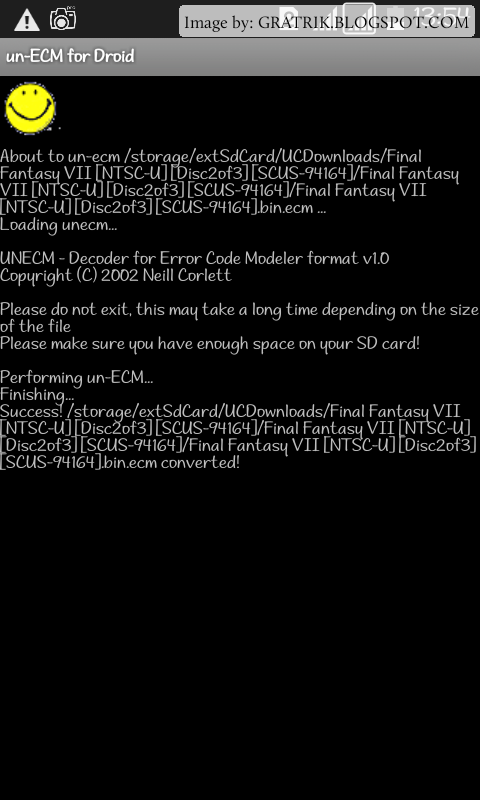 Personally, I start to know about ecm things when I was like playing PSX ROM's on emulators on my Android smartphone. Before the game disc image can be played on emulator, we must extract the .ecm file first. The real disc image file later can be viewed and played using emulator after we extract (un-ECM-ing) the .ecm file, where the real disc image file usually could be a .iso or .bin. If you are using windows, there are a utility program to unpack or un-ECM-ing the .ecm disc file image called PakkISO (and maybe other program). But on Android, I had a hard time to find an application that can extract .ecm file. The only Android app I know to compress or un-ECM-ing is "Un-ECM for Droid". Un-ecm for Droid is an Android application to extract (unecm-ing) a .ecm file. 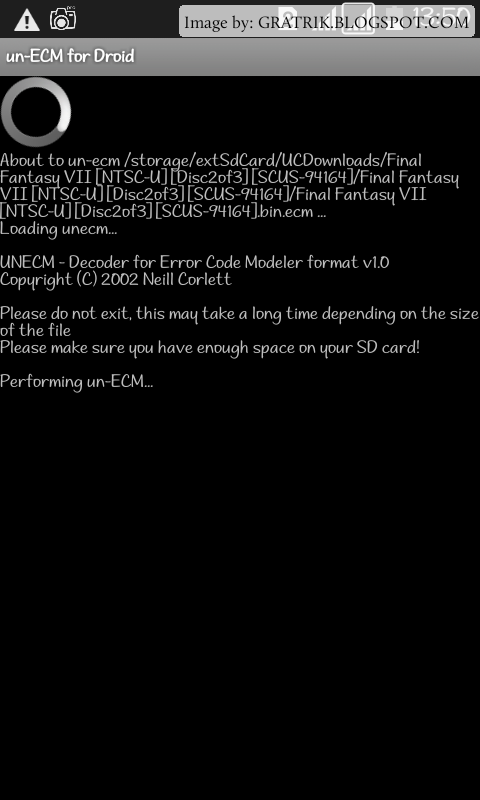 For example if you have a PSX ROM with format .bin.ecm or .iso.ecm, you can unecm it directly on your Android device so we can get the real .bin or .iso files. For reminder, that Un-ECM for Droid does not have home user interface. So to use this Android app you can use the "Open with" command when you opening or choosing a .ecm file from a file manager. Install the Un-ECM for Droid app. Make sure you have enough free space on the storage where the ecm file saved to save the extracted (the un-ECM-ed) disk image later. Open your file manager (for example from ES File Explorer), search for ecm files which you want to un-ecm, then choose (tap) it. Then next if a menu appeared, choose "Open as" or "Open with", and choose Un-ecm for Droid app. There are also some file managers that will automatically redirect us to Un-ecm for Droid app when we tap or choose the .ecm extension files. Now we are moved to the Un-ecm for Droid interface. You will see the time needed for un-ecm-ing the file that it will take around 20 minutes approximately or less (depend on file size) -> choose "Yes". Wait until the process is done, and your files is ready to be used. The extracted disc image file will be saved on the same directory where you save the .ecm file you used. The above Un-ecm for Droid APK Android application is purposed for testing only. If the app is work on your device, buy Un-ecm for Droid Android app from Play Store to support the future development of this Android app. Comments (0) in "How to Extract .ecm File on Android using Un-ecm for Droid App APK"